Oral diseases are significant public health problems considering their prevalence, impact on individuals and society, and their expensive treatment. Loss of teeth owing to periodontitis causes discomfort, compromises the esthetics and function. Moreover, the recent studies suggest an association between chronic low-grade infections such as periodontitis with systemic health problems including cardiovascular diseases, preterm low birth weight, diabetes mellitus, and chronic obstructive pulmonary disease. The conventional methods for the prevention of periodontal diseases are mechanical oral hygiene combined with proper professional maintenance respectively. In reality, however, the motivation and dexterity essential for optimum oral hygiene could be beyond the ability of most individuals. Antimicrobial mouthrinses are also suggested as adjuncts for mechanical plaque control methods. Chlorhexidine gluconate is used as gold standard antiplaque agent. However, altered taste sensations, staining of teeth, and development of resistant microorganisms have been observed as undesirable side effects of using it on long term basis. This necessitates the development of alternate strategies that act against periodontal diseases. One such strategy would be to verify the plant medicines with their “naturally occurring” active ingredients. The major strength of these natural herbs is that their use has not been reported with any side effect till date. A few studies have found herbal products to be effective in reducing plaque and gingival inflammation.,,,, In this background, the present study assessed antiplaque efficacy of Tooth and Gums Tonic, Hiora-GA gel, and Spirogyl Gum paint in comparison with chlorhexidine M gel in a double-blind randomized control trial. This was a parallel double-blind cluster randomized control trial carried out over a period of 8 months from November 2015 to June 2016 at Osmania Dental College and Hospital, Hyderabad. The ethical clearance was obtained from the Institutional Ethics Committee, Osmania Dental College and Hospital, Hyderabad. The study participants were recruited after written informed consent was obtained from each participant in local language. Participants were explained about the rationale for research, objectives, methodology, and risks and benefits of research to the society before obtaining informed consent. All the patients visiting the Department of Public Health Dentistry, Osmania Dental College and Hospital, Hyderabad, were initially screened by two trained and calibrated investigators. The participants fulfilling the following eligibility criteria were selected. Patient willing to offer informed consent and comply with research protocol. Participants with a known history of allergy to any chemical or herbal products. Sample size was estimated based on means for repeated measures analysis of variance assuming a within group variance of 0.5, between group variance of 0.4, Intraclass correlation coefficient was 0.5, for four repeated measures, effect size of 0.8 with 80% power at 5% level of significance for two-sided test using nMasters soft ware (Christian Medical College, Vellore). The sample size was found to be 17. The initial sample size was rounded off to 20 per group to compensate for any dropouts. Eligible participants were randomly assigned to one of the four groups using block randomization method by the coordinator. Group of five eligible participants were identified and assigned to each group consecutively by the coordinator till the number of participants in each group reached the required number of 20. In all, allotment to each group was made four times (each time a group of five eligible participants). Participants in each group were given a unique ID. The plaque, gingival status was assessed at baseline using gingival  and plaque index  by three trained and calibrated blinded investigators who were not involved in identification and group allocation of participants. Inter-examiner reliability scores for plaque and gingival assessment was satisfactory with an intraclass correlation coefficient score of 0.73 and 0.81, respectively. The supragingival plaque samples were collected from buccal surface of first permanent molar in maxillary arch on right side. The plaque samples were also identified with unique ID of the participants. The samples at baseline were identified with an alphabet B added to unique ID as a prefix. This ensured that the investigators involved in clinical examination of participants and microbiologist analyzing the plaque samples were not aware of group identity of study participants. Each participant was offered scaling and polishing following recording of baseline plaque and gingival status to remove visible calculus. Subsequently, participants in Group 1 received chlorhexidine M gel while participants in Group 2, 3, and 4 received Hiora GA gel, Spirogyl Gum paint, and Tooth and Gum Tonic, respectively. All participants were offered a kit containing the assigned oral health product with a soft bristled brush. The participants were instructed to brush twice daily using assigned toothbrush and their regular toothbrush using modified Bass technique. The brushing technique was demonstrated by a trained investigator and all participants were made to brush at least once after demonstration to make them appreciate the benefits of using this technique. Participants were requested to use the assigned gel twice daily as per manufacturer's guidelines. This was a noninferiority trial using chlorhexidine M gel as positive control while other three were controls. The mean of the bacterial code scores was computed for each group at baseline and 90 days after intervention and compared. The data were analyzed using SPSS (Statistical package for Social Sciences version 21, IBM, Chicago, IL, USA). The mean plaque and gingival score at each time interval between groups was compared using one-way ANOVA or Kruskal–Wallis test. The mean plaque and gingival scores between baseline and subsequent time intervals was compared using Friedman test. Tukey's post hoc test was used for multiple pairwise comparisons where relevant. The statistical significance was fixed at 0.05. A total 69 participants completed and 11 participants dropped out from the study. There was no significant difference in the mean age and gender distribution of participants in different intervention groups [Table 1]. The number of dropouts in each intervention group and reason for dropout of these participants is presented in [Table 2]. The dropout rate was 13.75%. The CONSORT flow diagram of the study is presented in [Figure 1]. There was no significant difference in the mean plaque scores of participants in different intervention groups at baseline as well as at different time intervals. However, at day 30, there was no evidence of plaque in Group 2 and 3 while plaque score of 0.1 ± 0.3 and 0.3 ± 0.5 were found in Groups 1 and 4, respectively. There was a significant reduction in the plaque score of participants between baseline and postintervention in each group [Table 3]. There was no significant difference in the mean gingival scores of participants in different intervention groups at baseline as well as at different time intervals. However, there was a significant reduction in gingival score of participants between baseline and postintervention in each group [Table 4]. 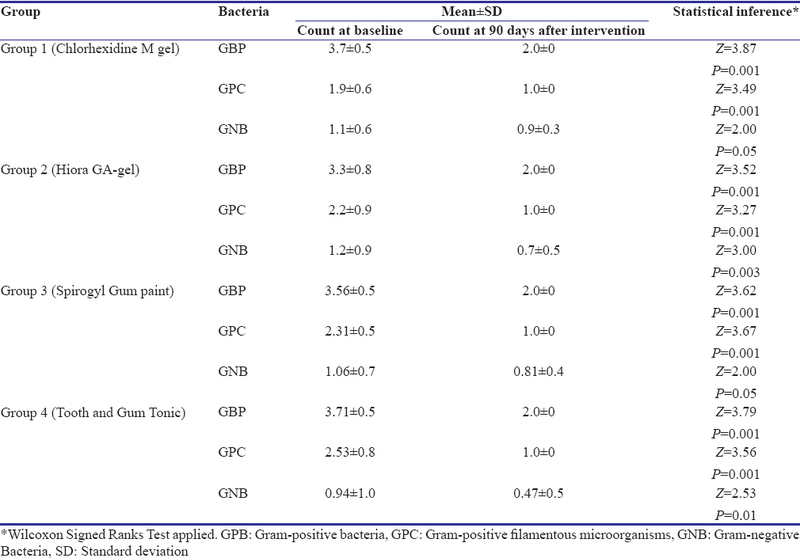 The microbiological assay of plaque samples revealed a significant reduction in the mean bacterial count of Gram-positive bacteria, Gram-positive filamentous microorganisms, and Gram-negative bacteria between baseline and 90 days after intervention in each intervention group [Table 5]. None of the participants reported adverse effects such as burning sensation, altered taste sensation, and ulcerations during the course of intervention. Mechanical plaque control methods are an established means for maintaining adequate oral hygiene levels. However, it was found through clinical experience and population-based studies that the accurate and complete mechanical plaque control methods are difficult to employ by majority of population. In this background, many chemotherapeutic agents have been evolved to control bacterial plaque, with the aim of improving the efficacy of routine oral hygiene measures. A growing interest in the development of plant-based medicines possessing antibacterial and anti-inflammatory activities for the treatment of oral diseases has been witnessed in the last two decades. This will facilitate to overcome harms allied with the extensive misuse of chemotherapeutic agents that induce microbial drug resistance. We assessed the efficacy of three plant-based gum astringents (Hiora GA gel, Spirogyl Gum paint, and Tooth and Gum Tonic) in comparison with chlorhexidine M gel over a period of 90 days. We found a significant reduction in mean plaque and gingival scores among participants in each intervention group at different postintervention intervals compared to baseline scores. However, there was no significant difference in the efficacy of these products. The bacterial count also reduced significantly 90 days after intervention compared to baseline levels in each group with no significant difference between groups. The reduction in the plaque scores in each group is attributed to antibacterial efficacy of these products along with mechanical debridement carried out after baseline examination. HiOra-GA gel contains Jatiphala (Myristica fragrans), Triphala, Asana (Pterocarpus marsupium), Arjuna (Terminalia arjuna). Antimicrobial efficacy is attributed to phytochemical constituents present in these herbal extracts. These results were in agreement with a study by Apoorva et al. who fund HiOra-GA Gel to be effective in reducing plaque and gingival inflammation. Triphala as a medicinal remedy in the treatment of gingivitis has been recommended from many centuries. Gupta et al. in their in vitro study have demonstrated the antimicrobial efficacy of aqueous and ethanolic extracts of Triphala on primary plaque colonizers. Prakash and Shelke  in their study found Triphala to be effective in reducing plaque and controlling gingivitis. Spirogyl Gum paint contains tannic acid, potassium iodide, iodine, thymol, menthol, and glycerin. The antimicrobial and anti-gingivitis effect is attributed to these constituents. Tooth and Gum Tonic contains extracts of echinacea angustifolia, echinacea purpurea and gotu kola, pure essential oils of peppermint, red thyme, cinnamon bark, eucalyptus globulus and lavender, plant saponins. The antibacterial and anti-gingivitis effect is mainly attributed to these ingredients. Chandrashekar et al.,, in their in vitro studies have demonstrated the antibacterial efficacy of eucalyptus plant extracts on plaque microorganisms. The plant-based medicines are adjuncts to mechanical plaque control methods and are being established as alternates to chlorhexidine., The lack of adverse effects over a period of 90 days demonstrates their safety to be used as adjuncts to mechanical debridement. The scaling and polishing undertaken following baseline assessment might have contributed significantly to reduction of plaque and gingival inflammation. However, the lack of significant increase in plaque and gingival scores over a period of 90 days could be due to the combined effect of mechanical plaque control measures along with the use of these astringents. The results indicate that these products may be used as adjuncts to mechanical plaque control methods. However, the efficacy of these products in patients having advanced periodontal disease need to be evaluated. We sincerely thank all the study participants, college administration, and microbiologist for their kind cooperation and at different stages of this project. Manjunath BC, Praveen K, Chandrashekar BR, Rani RM, Bhalla A. Periodontal infections: A risk factor for various systemic diseases. Natl Med J India 2011;24:214-9. Eley BM. Antibacterial agents in the control of supragingival plaque – A review. Br Dent J 1999;186:286-96. Samuels N, Grbic JT, Saffer AJ, Wexler ID, Williams RC. 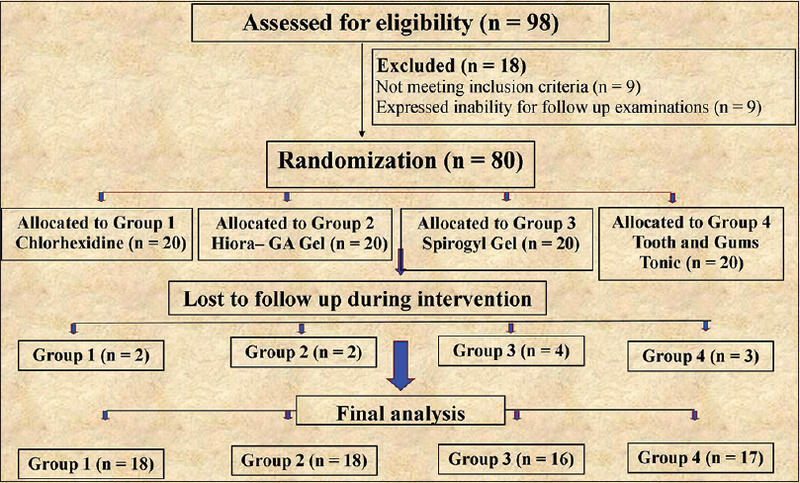 Effect of an herbal mouth rinse in preventing periodontal inflammation in an experimental gingivitis model: A pilot study. Compend Contin Educ Dent 2012;33:204-6, 208-11. Stoeken JE, Paraskevas S, van der Weijden GA. The long-term effect of a mouthrinse containing essential oils on dental plaque and gingivitis: A systematic review. J Periodontol 2007;78:1218-28. Patel RM, Malaki Z. The effect of a mouthrinse containing essential oils on dental plaque and gingivitis. Evid Based Dent 2008;9:18-9. Apoorva SM, Vinayashree MP, Suchetha A, Latha G, Sapna N, Bhat D. To compare the effect Triphala gel formulation and Cinnamomum gel formulation on gingivitis – A clinical study. Int J Appl Dent Sci 2015;1:136-40. Gupta R, Chandra Shekar BR, Goel P, saxena V, Hongal SG, Jain M, et al. Antimicrobial efficacy of aqueous and ethanolic extracts of Triphala on primary plaque colonizers: An in-vitro study. J Young Pharm 2014;6:7-13. Prakash S, Shelke AU. Role of Triphala in dentistry. J Indian Soc Periodontol 2014;18:132-5. Chandrashekar BR, Nagarajappa R, Singh R, Thakur R. An in vitro study on the anti-microbial efficacy of ten herbal extracts on primary plaque colonizers. J Young Pharm 2014;6:33-9. Chandra Shekar BR, Nagarajappa R, Singh R, Thaku R. Antimicrobial efficacy of the combinations of Acacia nilotica, Murraya koenigii L. sprengel, Eucalyptus hybrid and Psidium guajava on primary plaque colonizers. J Basic Clin Pharm 2014;5:115-9. Shekar C, Nagarajappa R, Singh R, Thakur R Antimicrobial efficacy of Acacia nilotica, Murraya koenigii L. Sprengel, Eucalyptus hybrid, and Psidium guajava on primary plaque colonizers: An in vitro comparison between hot and cold extraction process. J Indian Soc Periodontol 2015;19:174-9. Aspalli S, Shetty VS, Devarathnamma MV, Nagappa G, Archana D, Parab P. Evaluation of antiplaque and antigingivitis effect of herbal mouthwash in treatment of plaque induced gingivitis: A randomized, clinical trial. J Indian Soc Periodontol 2014;18:48-52.